Ghana has a mixed record in terms of health outcomes. 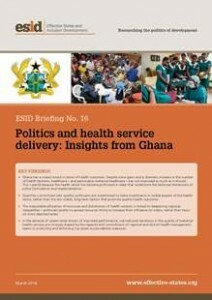 Research presented in this briefing suggests that these outcomes reflect the character of politics in Ghana, as well as the interaction of politics with the governance arrangements for the health sector. Improved performance will require building higher levels of oversight and accountability and learning from success stories where there are pockets of bureaucratic effectiveness.